Add another layer of elegance to your already beautiful table settings with our 6" normandy lace doilies! These charming lace doilies are perfect for up-scaling any event, from corporate dinners to wedding receptions and tea parties! In an instant, your displayed goodies will go from boring to beautiful, creating a presentation that your guests won't forget. "This is such a great price for how many doilies you get! They are adorable when used as drink coasters at weddings, showers, etc. Love them!" Each loop, swoop, and swirl around the edges of these doilies were patterned off of grandma's lace, bringing traditional, dainty charm to your tables and displays. Place under saucers, cups, platters, or bowls to accentuate your dishes and culinary creations! 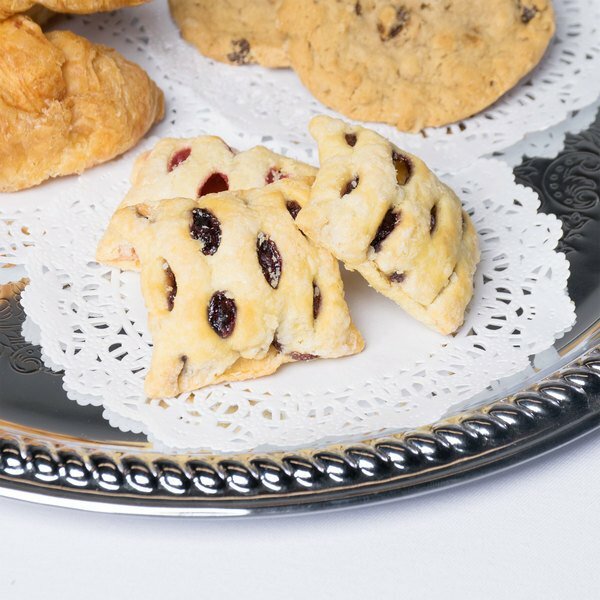 These visually attractive doilies will bring attention to your food with their charming details, welcoming your guests to taste that savory appetizer, or to nab that chocolate cookie. Made out of a sturdy paper material, these doilies will last through your event while maintaining their elegance. Plus, they can be thrown away at the end of the night, making clean-up quick and easy. Perfect Doily for our bakery. Dresses up most items. The doilies don't seem to stick together too much like some other ones I have tried. These doileys dress up our bread plates well when we stack a bowl of oil and vinegar or other dressings on them to present to the table. They do stick together so you need to peel them apart, which is good side-work during down time. These 6 inch doilys are perfect for my 4 inch cheesecakes. The box I ordered comes with so many that I shouldn't run out any time soon!! Allows us to stock a large amount at a very reasonable price. Provides a nicer look to our packaging and they are thick enough to hold up well. Sometimes a little tough to separate, but not such a big deal. These beautiful 6 inch lace doily are great for dressing up a cookie dish. I use around holiday season to make the presentation of my homemade cookies look better! Sir Clean recommended this product 6" Lace Doily - 1000/Case, really beautiful design, perfect to use in different event. Good quality and price. We like it! Love these doilies. There's not trimming bits in the box like the other brand, and they are of equal quality and weight. For a fraction of the cost. 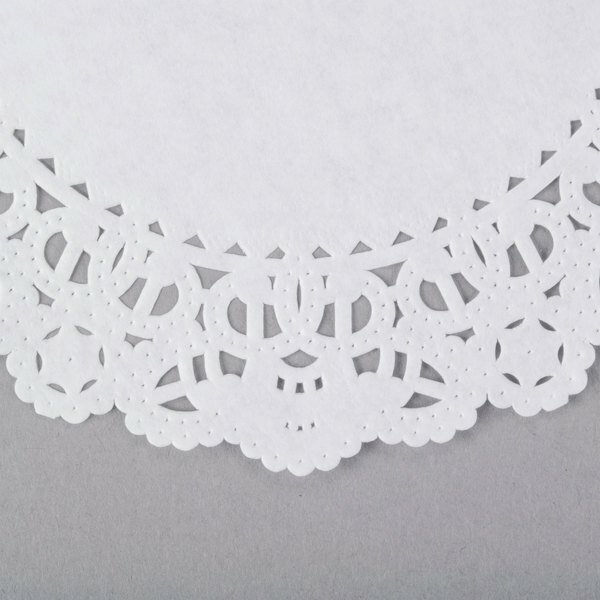 These doilies are the perfect size for putting on the plates under our butter warmers for the crab and lobster dinners. They make the plate look so nice..
We use these doilies to put under our 8 or 10 people tarts in our french bakery. We like the perfect white color. They are also nice in our display case to présent french pastries. This is such a great price for how many doilies you get! They are adorable when used as drink coasters at weddings, showers, etc. Love them! What a deal! These came packaged in a sturdy box, very neatly so there was not bending or folding of the doilies. These are classic doilies at a great price. Nice quality paper doilies with attractive pattern. Be sure to take some time to separate beforehand or you may end up using three at a time. I place thse 6 inch lace dollies on egg tarts and fruit tarts. They look wonderful and makes the dessert look so gorgeous. good price! My daughter done crafts with these at her wedding. They turned out great and we had a ton left over!! Such a great price i dare you to find this many for this low of a price anywhere else!! 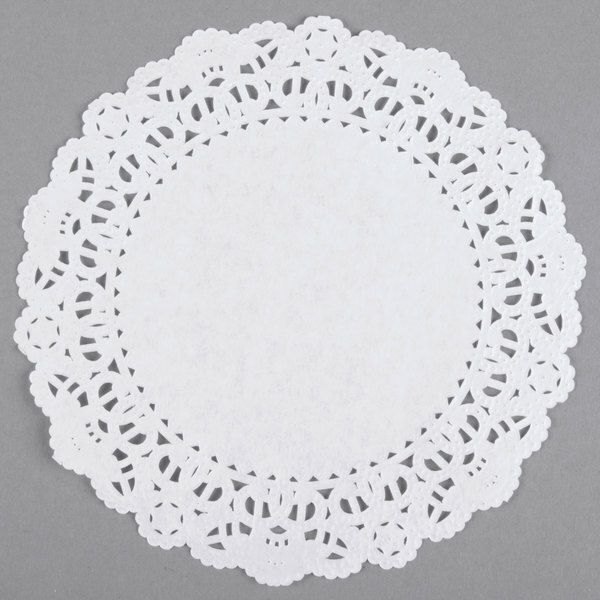 These paper doilies are perfect for cookie or pastry dessert trays. WOW them by always using them. People will love the presentation. Came them come back for more.